ruthdelacruz | Travel and Lifestyle Blog : Lunch Buffet at Marriott Cafe (Resorts World) - 50% Discount til October 31st! Lunch Buffet at Marriott Cafe (Resorts World) - 50% Discount til October 31st! I promised myself I would no longer indulge in food trips and even dismissed the idea of opening a food blog. I have a goal that I need to reach, remember? But when an invite to try out the buffet offering at Marriott Cafe was sent to my inbox, I could only think of one response - "Yes, I would be there!". 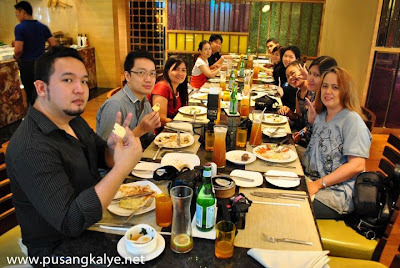 So I was there in Marriott Hotel in Resorts World, Saturday lunch time, together with other bloggers and bloggies (term used by Tatak Digitista which refers to his blogger friends). I am now calling them bloggies because I am always with them during events. I was sooo glad I went because not only did I get to taste Marriott Cafe's lush buffet offering, but I finally meet the bloggers behind the ChingReyes.com website (yes, she's one travel blogger who also loves trying out hotel buffets! ), and Crumpylicious Blog (she/he/they know how to flatter me - yes, the blog is owned by a couple - telling me how much they love my way of writing. Thank you! Love the posts in their blog too!). So enough of the talk, let's get straight to the buffet table. We were greeted with the desserts table as soon as we walked inside the cafe. I know we were on for a great treat! I checked all the stations - fresh seafood, unique dish for each type of meat, sushi bar, dimsum station, and more. It is a great selection of Asian, Mediterranean and Filipino cuisines. The selections are carefully picked and presented - not the usual dishes you see in restaurants and hotel buffets that you just tend to skip. Everything is worth tasting and trying. Every dish is a different experience. I personally love the Singapore-style Lobster which was preferred by the house chef that afternoon. It is spicy, with that hint of curry and different spices. It spells love and gustatory. It is not the best picture - but that''s the goal - you have to go to Marriott Cafe and experience it! Each dish is unique and has a different flavor to offer. This is the only buffet offering that I didn't skip most of the food. Are you familiar with that buffet offerings which have different dishes but they tend to taste the same? Marriott Cafe is the exact opposite. Nope. There is no plating contest.. But we were pretending there was! I knooow.. It looks like a Christmas Plate! This was Pusangkalye''s Dessert Plate. Mine was full of chocolate cakes! I loove! This was NomNomClub's Plate! I wanted a Peking Duck but they didn't have wrapper that day.. So I just indulge with these slices. Never mind the cholesterol! This looks yummy! But I was already full. I would try this next visit! They even use special ingredients, spices and sauces for their recipes. Check out this soy collection on display from China. I love the ambiance with its light-painted walls and drop lights. The couches and chairs are comfy. The main dining area is separated with a make-shift wall (with nice lightings) and there is a wide walkway making it easier for diners to roam around the station without causing any "traffic". There are even closed areas which I think are for groups and meetings. The staff and chefs are not just skilled and friendly, they are knowledgeable about the products they are serving. I got so curious with this Knuckle Sauce I found in the Dimsum Area, so I asked what this sauce is made-of and where did this originated. He mentioned a number of spices which I cannot remember but he said it is a recipe from China. By request - they will cook a dish for you! I couldn't take a good picture so I might as well take their pics! Happy to smile and pose for this pic! I would say, it is very reasonable for Php1,750! 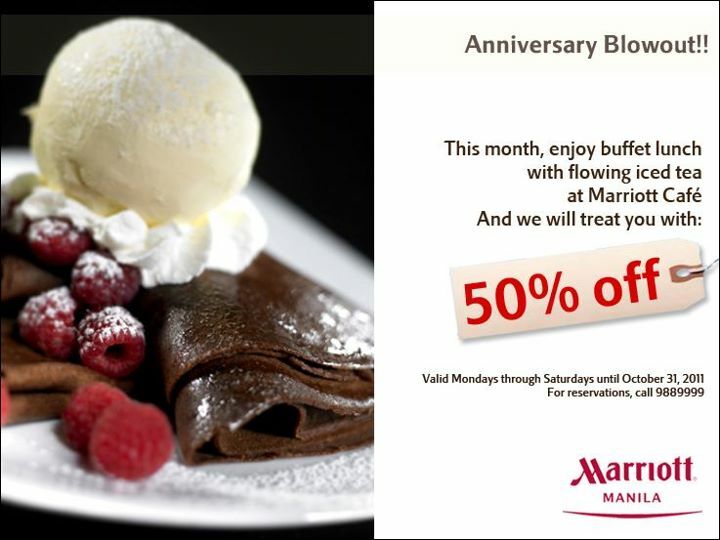 But wait, there's more.. Marriott Cafe is offering 50% discount for Lunch Buffet in celebration of their second year anniversary! Lunch Buffet is at Php 875! The offer is good until October 31st only! The offer comes with bottomless iced tea. They also serve all types of soda, juices, wine and alcohol. Here are some of the photos I have taken. My bloggies brought their best cameras and lenses, making them look so commanding, I felt that the food were posing for their shots. For reservations, please call the Marriott Hotel Manila at +63.2 988.9999. Don't forget to like the Marriott Hotel Manila Facebook Fanpage at https://www.facebook.com/marriotthotelmanila. It's all good food and good vibes last Saturday. I skipped dinner that night and enjoyed a night sleep (my sleeping hours usually in the afternoon..). Thank you Savannah and Pusangkalye for the invite. © ruthdelacruz | Travel and Lifestyle Blog : Lunch Buffet at Marriott Cafe (Resorts World) - 50% Discount til October 31st!